Jump on our VIP List – http://BluegrassTeam.com/homefinder – we’ll send you new properties before they hit the market. call Ken 859-494-5521 VIDEO – VIDEO – Sustainable Farm, Cabin style cedar house, 25 ac, Man Cave, She shed, Creek, Prepper property. Hunter’s Paradise in Kentucky – hunt from your backyard. Are you looking for she shed ideas? or she shed plans? I have some great she shed images here. 25+ acres, 1400± sf cedar home 3br, outdoor shower, acres and acres of marketable timber – just 5-6 miles to Historic town of Hustonville, 10 min to shopping. Hunter’s dream – hunt right out your back yard – mostly all wooded – and PRIVATE. This sustainable farm has Marketable Timber – giving you income from your farm. And isn’t that what you want? Farm income? yup. Are you looking for sustainable living ideas? with a sustainable house – on a sustainable farm? This might be the place for you to own. Have a great evening and thanks for Sharing this Cabin style cedar house to friends and family! Here it is – use this is a bug out place, weekend getaway, primary residence – what would YOU use it for? You won’t believe the views. If you are prepper minded, this is the best of both worlds – the land and the shop are for you – the house will please your spouse (it is really nice). 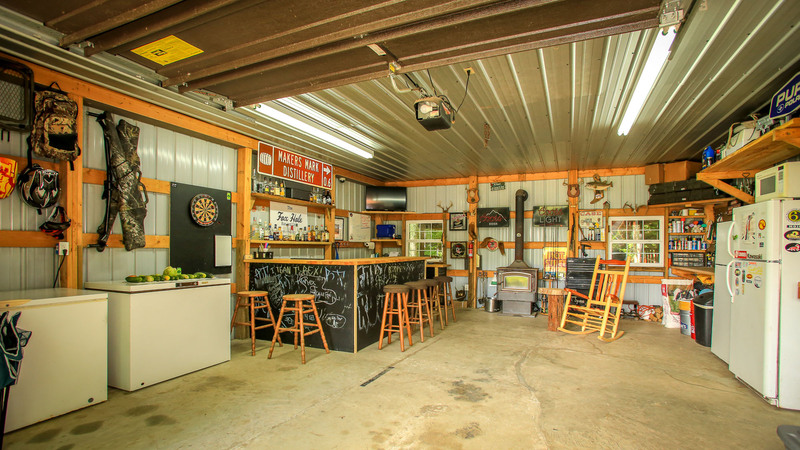 2. it has a metal shop that was turned into a rocking Man Cave or She Shed – with overhead door, a walk door, power and a full-on BAR built already — and a woodstove and sink out there. 5. Best part is the view and PRIVACY – and you need farm income? This farm has marketable timber! 7. it is just 10 min to Dollar General, 20 min to College Town, Starbucks, TJ Maxx, Hobby Lobby, shopping, restaurants, medical, jobs. 1 hr to Lexington, KY.
Do you know how good independence feels? Those who know – surely know. Woodstove, shop, your own land to hunt on – yup —- and close to town. And you can save even money on your heating bills. Heat with wood (even have it delivered and heat your home for 300 bucks for the whole year). preppers paradise, preppers paradise for sale, log cabin style, cabin house, bartering, farm income, income from farm, marketable timber, how to sell marketable timber, Cedar Cabin, sustainable living ideas, sustainable living homes, sustainable farm kentucky, sustainable living homes for sale, Man Cave, She-shed, Creek, Prepper property, she shed, shed plans, she shed ideas, she shed images, she shed plans.